An unusual duo of keyboards and drums that released a little known and incredibly good album in 1973 before disappearing. 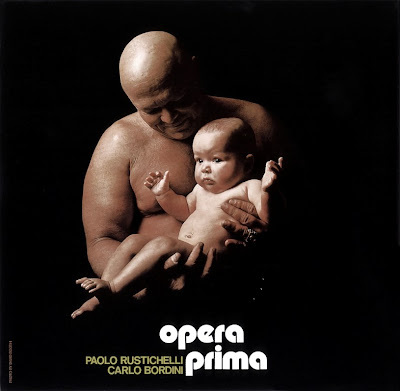 Paolo Rustichelli and Carlo Bordini had played with Cammello Buck, along with guitarist Pino Belardinelli and bass player Mauro Morlacchi, and they even appeared at 1972 first edition of the Villa Pamphili Pop Festival. With a new bass player, Pasquale Cavallo (from the latest line-up of Panna Fredda), they signed a contract with the Delta label, but didn't get to release anything despite some demo recordings, and their management suggested to reduce the four-piece to a duo in the same style as the UK band Hardin & York. The album, Opera prima, is a very good LP, obviously based on keyboards and the lack of other instruments is not particularly heard. The vocal parts are short and the voice is not great. The LP contains six long tracks with Icaro and the instrumental Natività being the best cuts. Rustichelli & Bordini appeared at Naples' Be-In Festival in 1973 and supported West Bruce & Laing in Rome. After the album Carlo Bordini was contacted by a group called Oliver, that included Claudio Simonetti, Massimo Morante and Fabio Pignatelli, this was to be the first line-up of Goblin; he also appeared on the Cherry Five album.